Samifer is a portmanteau made up of Sam and Lucifer. It arose in fandom after 5.04 The End, wherein Dean is transported to the year 2014 by Zachariah. In this future Sam has given his consent to allow Lucifer to use him as his vessel, thereby bringing about the Apocalypse and the collapse of mankind. Dean witnesses "Samifer" killing his future self and briefly speaks with Samifer before being allowed to live. 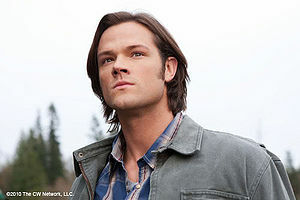 When joined with Sam, Lucifer resembles his appearance as described in biblical lore; most notable being his "long beautiful hair" (Sam's Hair). Samifer again appears in 5.22 when Sam allows Lucifer to possess him, as part of the plan to trap Lucifer in the Cage. Jared used the term "Samifer" at Asylum Europe 2 (Source). Lucifer: Oh. Hello, Dean. Aren't you a surprise. 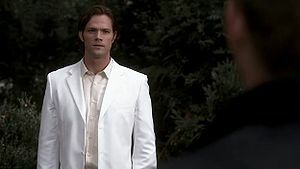 [Lucifer reappears behind Dean] You've come a long way to see this, haven't you? Dean: Well, go ahead. Kill me. Lucifer: Kill you? [Lucifer stares at Future!Dean's corpse] Don't you think that would be a little...redundant? [sighs] I'm sorry. It must be painful, speaking to me in this shape. But it had to be your brother. It had to be. [Lucifer reaches for Dean's shoulder] You don't have to be afraid of me, Dean. What do you think I'm going to do? Dean: I don't know. Maybe deep-fry the planet? Lucifer: Why? Why would I want to destroy this stunning thing? Beautiful in a trillion different ways. The last perfect handiwork of God... You ever hear the story of how I fell from grace? Dean: Oh, good God, you're not gonna tell me a bedtime story, are you? My stomach's almost out of bile. Lucifer: You know why God cast me down? Because I loved Him. More than anything. And then God created... You. The little...hairless apes. And then He asked all of us to bow down before you—to love you, more than Him. And I said, "Father, I can't." I said, "These human beings are flawed, murderous." And for that, God had Michael cast me into Hell. Now, tell me, does the punishment fit the crime? Especially, when I was right? Look at what six billion of you have done to this thing, and how many of you blame me for it. Dean: You're not fooling me, you know that? With this sympathy-for-the-devil crap. I know what you are. Dean: You're the same thing, only bigger. The same brand of cockroach I've been squashing my whole life. An ugly, evil, belly-to-the-ground, supernatural piece of crap. The only difference between them and you is the size of your ego. Lucifer: [smiles] I like you, Dean. I get what the other angels see in you. Goodbye. We'll meet again soon. Dean: You better kill me now! Dean: You better kill me now. Or I swear, I will find a way to kill you. And I won't stop. Lucifer: I know you won't. I know you won't say yes to Michael, either. And I know you won't kill Sam. Whatever you do, you will always end up here. Whatever choices you make, whatever details you alter, we will always end up... here. I win. So, I win. Lucifer: See you in five years, Dean. Samifer is also used to refer to Sam/Lucifer in fanworks. In fandom, Lucifer is sometimes referred to as "Lucy" or "Luci"
This page was last edited on 30 March 2016, at 03:54.